I know these are old wives tales aren't accurate, but it's fun to play along anyway! I've been craving sweets the past week but before that it was all salt. So I counted both of them. Personally I think the craziest of them all is the ring test. It's so dependent on your ring, the string, and whether you can hold your hand steady. Whoever came up with that one must have been smokin' something. So what's your guess? Are you on Team Pink or Team Blue?! Ooh Exciting!! When do we get to find out?? Team pink all the way - they say the Chinese Calendar one is always on point...but either way it will be the cutest little babe ever! I think the sweet v. salty cravings (at least early on) are very telling! I think GIRL! Blue!!! But I'm wrong usually. I was certain my coworker was having a boy and it was a girl! I'm guessing BOY!!! Can't wait to find out! 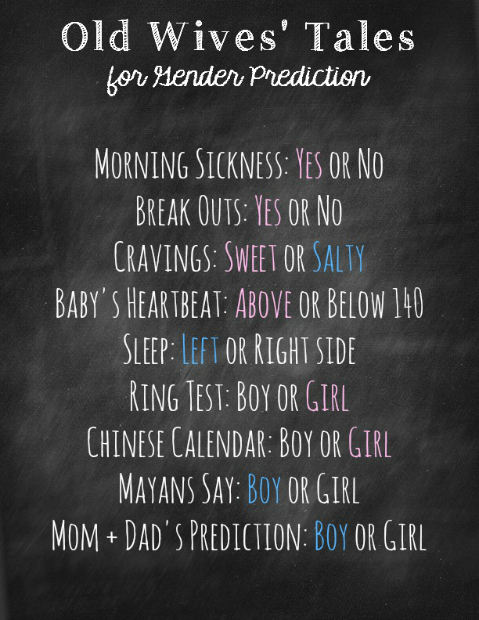 I think its a GIRL all the way even before this test!! Ah such and exciting time!! Most of my friends who have had babies were right on with the gut instinct! Maybe you will be too?? I'm guessing girl! Eeekk so exciting!